Difficult decisions and choices must be made when you lose a loved one. 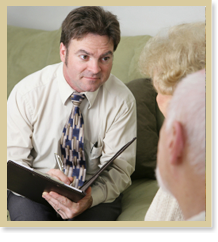 Cremation Options is here to provide proper guidance for planning suitable cremation arrangements for your loved one. For your convenience, our professional team is here 24 hours daily to answer all of your questions and concerns. Our goal is to help you decide which type of service best suits your loved one. In fact, choosing cremation increases your options when planning a funeral. We have created this website as a tool for you to gain as much knowledge on cremation as possible. Once you have chosen from the many options available, please contact our firm so we can properly assistance you. It is very important to consider all types of services. Our staff will assist you in creating a unique memorial for your loved one. Once you decide which type of cremation service you want to plan, our courteous staff will be pleased to help personalize the gathering to fit your loved one's personality. We are here to make planning cremation arrangements as simple and easy as possible. Be confident that we will be by your side guiding you step-by-step throughout the entire planning process. Cremation following a Traditional Funeral Service This type of ceremony is planned the same as you would a traditional burial service with the exception of cremating instead of going to the cemetery for a burial following the service. You may decide to purchase a cremation casket or you can choose to rent a "rental casket" for the visitation. It will provide a savings to you if you opt to rent a casket. After the service, you can have your loved one placed in an inexpensive alternative (corrugated) container suitable for the cremation process. 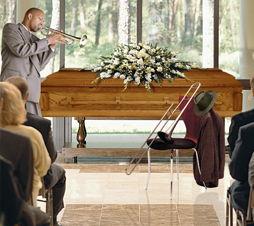 It is your preference whether to have a visitation with or without an open casket. A private family viewing is a very common choice among families if they decide to have a closed casket during the visitation. After the visitation concludes, there will be a memorial service and then, after the service, cremation will take place. The family may opt to follow in procession to the crematory. Traditional cremation arrangements of this kind often provide peace and comfort for some to begin the healing process. Cremation with a Memorial Service Another option is for the decedent to be placed in either a cremation casket or alternative container with cremation to follow. Once cremation has taken place, it is the family's choice whether or not to have the cremated remains present during the memorial service. The ceremony can take place at the funeral home, an outdoor place, religious facility or another location. To make the gathering more personal families can place photographs and memories throughout the place of service. If the cremated remains are to be buried in a cemetery or placed in a niche following the ceremony, this can take place immediately after the service with or without a funeral procession. You can also decide to have the cremains interred or scattered at a later date or you may want to keep the cremated remains in your possession. When making cremation arrangements your funeral director will suggest the many options that are available to you and your family. Direct Cremation Cremation without any type of gathering or service is considered a direct cremation. In this case, the decedent will be transported directly to the crematory. In accordance with state laws after authorizations are signed, the crematory will proceed with cremation. When making the cremation arrangements you may want to consider having your loved one's cremated remains placed in a decorative cremation urn if you plan on keeping them in your possession or interring them at a cemetery. If you have decided to scatter the cremains then you can opt to select a scattering urn or have them placed in a temporary receptacle. If you are not able to purchase an urn at this time, you can keep the cremains inside of a temporary hard plastic or corrugated container until you make a decision. There are many other unique cremation arrangements that can be planned. A few distinctive suggestions are: The cremated remains can be placed in the casket of a loved one that will pass in the future. You may want to scatter them at your loved one's favorite place or at sea. Cremated remains can be launched into space for eternity. They can be placed inside a coral reef in the ocean. Or they can simply be placed inside an urn, cremation jewelry or several keepsakes and dispersed to family members. People are often unfamiliar with the many options that can be chosen when planning cremation arrangements. The opportunity to personalize and carry out your loved one's wishes is priceless. Please take your time to browse our site and be creative. Our goal is to provide the most dignified and personal service at the lowest possible price. For more options and advice when planning cremation arrangements for your loved one, please complete the contact us information and your request will be fulfilled promptly.